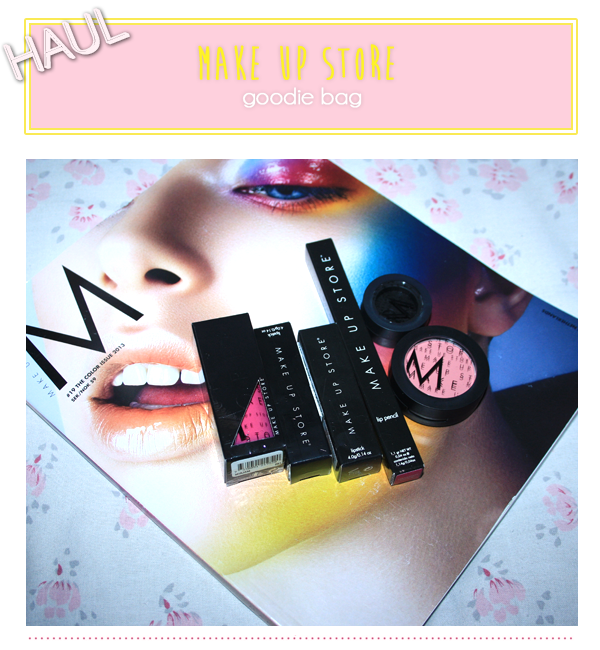 Yesterday, I visited a newly opened Makeup store called MAKE UP STORE in Malta at the Point, Sliema. I have been loving the feedback that I have heard from others who have purchased from there. I would consider the brand somewhere near MAC, Nars and MUFE for quality and they affordable but can be pricey just as other high end brands. After interacting with them via Facebook, a fellow blogger and I wanted to go down and shop and treat ourselves after pay day. We were greeted by the gorgeous Sales Assistants as well as Vanessa, who is the mastermind behind their Facebook Page. They Quickly greeted us knowing who we were which is quite a nice feeling knowing they follow our interactions online and love our blogs. As you can see from the about photo, they kindly enough surprised us with a goodie bag each. Inside the bag was a couple of products from the COCKTAIL COLLCTION and the famous M Magazine that after taking a look at it is full of inspirational pictures, it is a must see. (You can pick up a free copy from the point at the moment). I Did purchase a Blush and a Lipstick which if i am not mistaken €13.99 each but with my discount they only were €11 euros which was pretty decent for a high pigment product. I will be testing these goodies out over the next week or so and you will be seeing reviews over the next couple of days! i look forward to hearing more about this brand, Make Up Store!